The white powdery substance on the roses and the squash leaves in your vegetable garden is known as powdery mildew. Powdery and downy mildew (which appears on the underside of leaves) are caused by a fungus and can damage the plant. Since it is a mildew, the question arises whether you can use chlorine bleach on the plants to treat this fungus. The simple answer to this question is, "No." In her article, "The Myth of Cloroxed Clippers," Dr. Linda Chalker-Scott (Extension Horticulturist and Associate Professor, Puyallup Research and Extension Center, Washington State University) states, "Plant health damage: Bleach is extremely phytotoxic, more so than any of the other commonly used disinfectants." Not only should bleach not be used on plants that you want, it can be used as a weed killer. Put some in a spray bottle to treat unwanted plants. Should any get on the plants that you want, rinse the plant with water. There are gardening experts who instruct people to use a diluted bleach and water solution to sterilize garden tools, to prevent passing disease from one plant to another. However, Dr. Chalker-Scott states that this is not a good practice for several reasons. Chlorine bleach will pit the metal in gardening tools and, in addition, plants can be damaged from any bleach residue left on the pruning shears. To disinfect pruning shears and other gardening tools, she recommends cleaning off any dirt from the tools and then use household cleaner to disinfect it; she mentions the original Lysol (the phenol-based) as her personal favorite for this purpose. Treating mildew involves treating the plant and surrounding area. 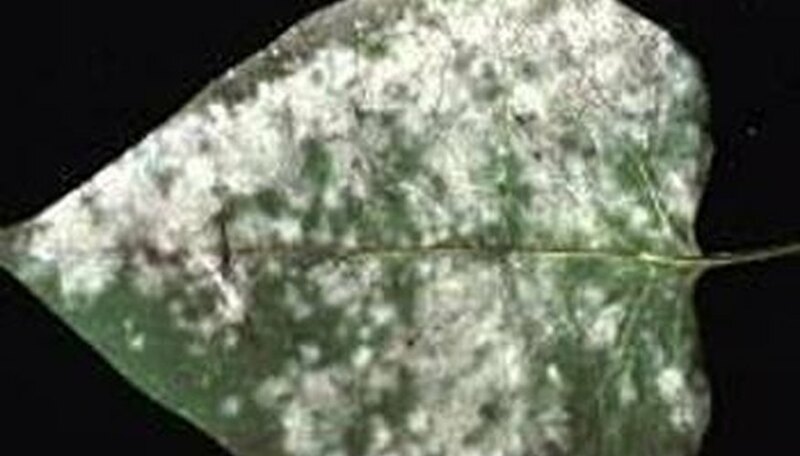 Use a fungicide to treat powdery and downy mildew. However, check the label; mildew is specific to the plant. The treatment for mildew on a rose would not be the same as the mildew on vegetables. According to Mary Robson of the Washington State University Extension, in her article 'Powdery Mildew,' "Unlike many other fungal problems, powdery mildew will succumb to fungicides after the symptoms show up." To fight the spread of mildew, Burpee Complete Gardener recommends cleaning up any fallen leaves or blossoms under the plants. Make sure the area has good circulation and avoid overplanting. In a vegetable garden, rotate the planting sites of closely-related crops. If the plant is severely infected, remove it from the garden and throw it away; do not add it to the compost. "The Myth of Cloroxed Clippers"